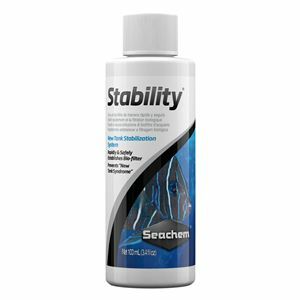 Seachem Stability® will quickly and safely establish the aquarium bio-filter in freshwater and marine systems and therefore help to prevent " new tank syndrome" which is the number 1 killer of fish . Stability® is formulated specifically for the aquarium and contains a blend of aerobic, anaerobic, and facultative bacteria which help the breakdown of waste organics, ammonia, nitrite, and nitrate. It is a product that contains in a liquid, billions of four species of bacteria. Two nitrifying bacteria , one waste eating bacteria and a fourth bacteria species that eats nitrate - wow we can hear you all saying ! Stability® is completely harmless to all aquatic organisms as well as aquatic plants, thus there is no danger of over dosing . Stability® is the result of nearly a decade of research and development and represents the current state of the art in natural biological management. The bacteria used in competing products are inherently unstable. The conditions necessary for their growth and development fall into a very narrow range of temperatures, pH, organic loads, etc. When any of these parameters are not strictly within the proper range, the bacterial culture quickly crashes and dies. Stability® does not contain any of this type of unstable bacteria. In answer to the "why use Stability" question the question should read " why not?" , and we don't really have an answer for that as there is no good reason not to use Stability .